Traveling to China with Toddlers and Preschoolers is an entirely different game. Children at this early age will not care about the largest palace in the world or 5,000 years of history! "As with most places with young children, it is about the "mundane" daily experiences that are most interesting and most memorable... What children remember is the markets, the smells, the people, the activities... not the museums or even the Great Wall..."
and watching the dancers/performers at Tiantan park (good for running around, climbing). 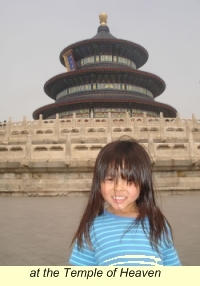 On a later trip, we did the tourist things, the Great Wall, Forbidden City, etc..
We stayed near Wangfujing and so with jet lag, each morning I would take the double stroller with the two kids and walked through the Forbidden City. At the Western exit, we would grab some bao zhi on the street on the way back to the hotel. I took my 4 year old daughter to her grandmother's hometown (a small city 45 minutes outside of Chengdu). We stayed at the Sichuan Hotel in Chengdu which is perfect for children and for the pocketbook (centrally located and buffet breakfast, 5 minute walk from McD). 4 year olds are not interested in the history or museum, but they love street markets, the pedicabs and eating in locale street stalls. There is a Panda Research Center (not Wolong) that is closer to Chengdu and is a great place to spend a few hours. 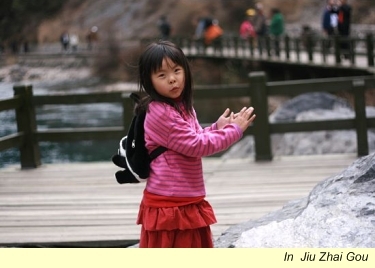 We also went to Dujiangyan (which may have been destroyed by the latest earthquake). This is fascinating, and for kids, it's just a lot of fun climbing up/down stairs and seeing the views and crossing the bridges. My 4-year old daughter did NOT like the traditional Sichuan face changing performances (just a warning). JiuZhaiGou is high in the Tibetan mountains. It's a quick 45 minute flight from Chengdu. Though my children didn't fully appreciate the natural beauty, they liked the bus rides and running along the well-maintained paths. Disneyland - This is always fun. But be warned, Disneyland Hong Kong is a FAR cry from Disneyland Tokyo, Anaheim, Orlando or even Paris. It is a very much abridged version and is really quite far from the Hong Kong island. It's cool to see the Disney characters singing in Cantonese and Mandarin. Shanghai is not a child-friendly city at all. No children about (only a few crowded on the playsets inside the McDonalds). The Aquarium in Pudong is a good 1/2 day trip. The underground cheesy pod ride (across the river) is actually a lot of fun despite the kitsch-iness. Nanjing Dong Lu at night is fun for the kids because it is bustling, there is a Haagen Dazs (though overpriced) and a child's train ride. But aside from these things, it is hard to keep a small child occupied in Shanghai for more than a few days. 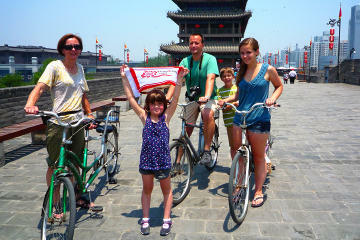 The river cruise (1-day) is a very nice way to get from Guilin to Yangshuo. Guilin itself doesn't have much for the kids to enjoy (they can't really get into the carvings, history or poetry, though they liked to play in the caves). The underground caves which are very cool. There are boat rides, climbing, and color stalactites. We also went to a really cool "eco-park" where everyone wore grass shoes and took a hike through the park, which included a climb up the waterfall (truly awesome in the humidity). There was also a zip line and playgrounds along this hike. 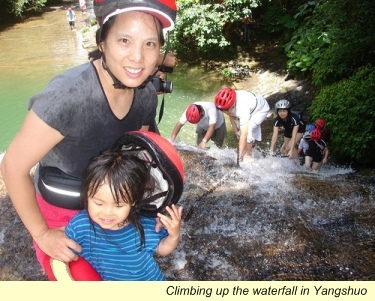 In general, Guilin was appealing to children because there is a lot of opportunities to play in the water, run around, and see/hear a lot of new experiences. One thing I would HIGHLY discourage is visiting a Big Cat Park - this is a place where they raise tigers, lions, jaguars to be sent to zoo's around the world. As a Westerner, I found this place to be a bit cruel to animals and was very disturbed to see a live cow get eviscerated by a lion (as a special show). 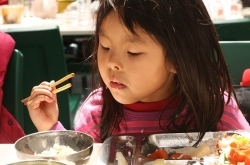 Having lived in HK in the past and traveling frequently to China, I have never had any problems with food or illness or anything like that, despite not ever taking the precautionary immunizations. However, that being said, my 1-year old son, upon going to Shanghai developed salmonella the last day (probably eating watermelon, tomatoes at the restaurant) which lasted 3 months, several tests, and contact from the local health department upon our return. So beware when eating raw fruits and vegetables. As with most places with young children, it is about the "mundane" daily experiences that are most interesting and most memorable. I wouldn't focus on trying to explain history or hitting the museums - everyone will be miserable. 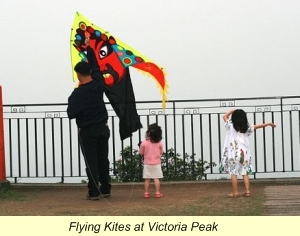 Do what the locals do and the children will love the experience. "Qlubb.com is a simple web-based group coordinator that has event calendaring, sign-up sheets, photo sharing, member rosters, task reminder service, and bulletin boards. You can communicate with other parents in your child's classroom by notifying them of events, manage party sign-ups, share photos, manage playgroup rosters and more. Check it out, especially if youre a classroom volunteer."